(Carolyn Kaster | The Associated Press) Robert Rosner, chairman of the Bulletin of the Atomic Scientists, right, and Bulletin of the Atomic Scientists member Lawrence Krauss, left, stand next to the Doomsday Clock after unveiling it during a news conference at the National Press Club in Washington, Thursday, Jan. 25, 2018., announcing that the Bulletin of the Atomic Scientists has moved the minute hand of the Doomsday Clock to two minutes to midnight. 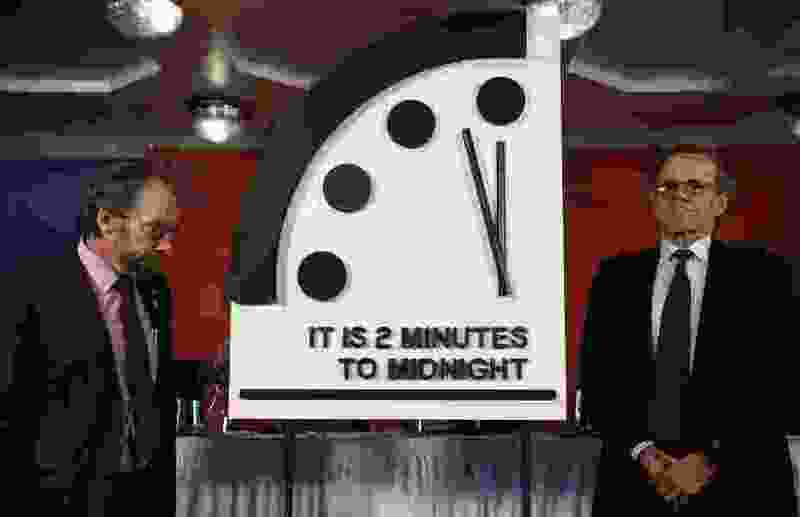 Guided by concerns about nuclear proliferation, global warming and cybersecurity, the Bulletin of the Atomic Scientists has kept the minute hand of its 72-year-old Doomsday Clock at 2 minutes until midnight, the closest humanity has been to Armageddon since 1953, when the U.S. and the Soviet Union first detonated hydrogen bombs. What became known as the Doomsday Clock started life in 1947, when editors of the Bulletin of the Atomic Scientists shifted its format from a newsletter to a magazine and hired artist Martyl Langsdorf to come up with a cover for the re-launch. The clock became a cold-war icon, putting a number, however impressionistic, on exactly how paranoid everybody should be about the end of civilization. The first clock was set at 7 minutes to midnight. Since the end of the Cold War, the clock has adapted to reflect the threats of the modern era such as climate change, cybersecurity and nuclear proliferation. In 2019, just as there is no shortage of destabilizing global risks, there is no shortage of attempts to gauge them, including the World Economic Forum Global Risks Report, Aon’s global terrorism and political risk maps, the Bloomberg News Pessimist’s Guide to the year ahead and Carbon Clock.